Extracorporeal photopheresis (ECP) is a widely used clinical cell-based therapy exhibiting efficacy in heterogenous immune-mediated diseases such as cutaneous T cell lymphoma, graft-versus-host disease, and organ allograft rejection. Despite its documented efficacy in cancer immunotherapy, little is known regarding the induction of immunostimulatory mediators by ECP. In this article, we show that ECP promotes marked release of the prototypic immunostimulatory cytokine IL-1β. ECP primes IL-1β production and activates IL-1β maturation and release in the context of caspase-1 activation in monocytes and myeloid dendritic cells. Of interest, IL-1β maturation by ECP was fully intact in murine cells deficient in caspase-1, suggesting the predominance of an inflammasome-independent pathway for ECP-dependent IL-1β maturation. Clinically, patient analysis revealed significantly increased IL-1β production in stimulated leukapheresis concentrates and peripheral blood samples after ECP. Collectively, these results provide evidence for promotion of IL-1β production by ECP and offer new insight into the immunostimulatory capacity of ECP. Extracorporeal photopheresis (ECP) is an immunomodulatory cellular therapy exhibiting clinical efficacy for attenuation of graft-versus-host disease (1–3) and solid organ transplant rejection (4) and for the treatment of cutaneous (5–7) and noncutaneous T cell lymphomas (8). ECP involves collection of leukocytes by apheresis that are exposed to 8-methoxypsoralen (8-MOP) and UVA light and retransfused into the patient (9). Numerous studies have reported that ECP can expand the number of regulatory T cells (Tregs), providing a rationale to understand the immunoregulatory efficacy of ECP for the treatment of graft-versus-host disease and solid organ transplant rejection (10–12). In contrast, only few publications have revealed the immunostimulatory activity of ECP, which suggests that ECP promotes monocyte differentiation into dendritic cells (DC) and elevation of TNF-α production (13–15). IL-1β represents a highly inflammatory cytokine that is produced primarily by monocytes, macrophages, and DC after triggering of pattern recognition receptors by exogenous or endogenous substances (16–18). However, biologically active IL-1β requires posttranslational activation by the inflammasome pathway, leading to cleavage of pro–IL-1β into the active IL-1β via the cysteine protease caspase-1 (19). 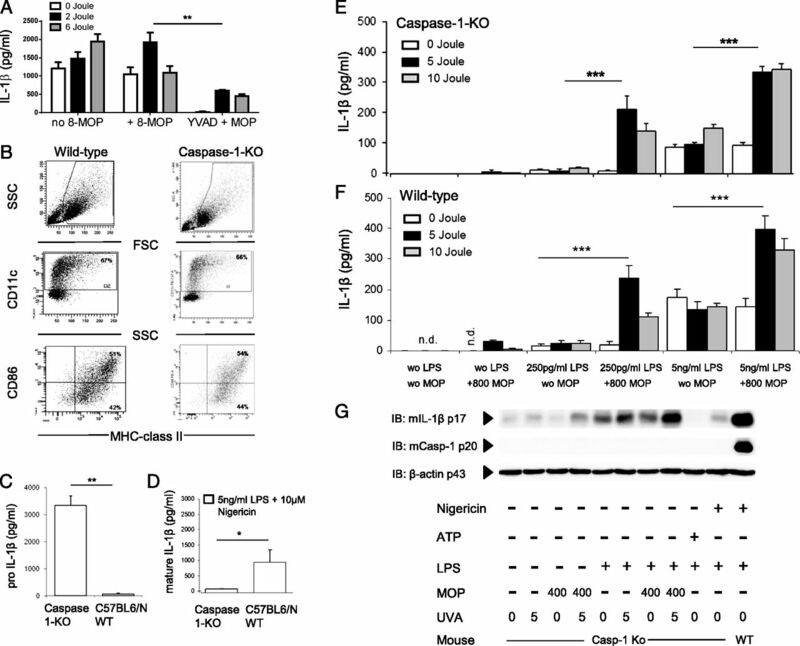 In addition to IL-1β activation by inflammasome-dependent caspase-1, other serine proteases being released by a number of different cells during inflammatory conditions can compensate for caspase-1 (20, 21). Joosten et al. (22) reported enhanced synovial bioactive IL-1β in a caspase-1–deficient mouse model of acute arthritis that was susceptible to suppression of proteinase 3 activity. In addition, Mayer-Barber et al. 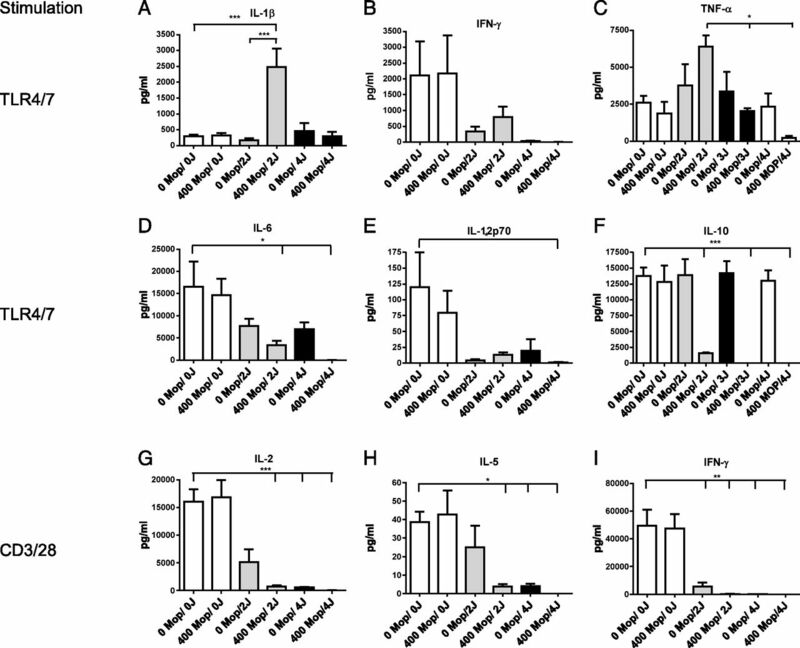 (23) reported unimpaired IL-1β production in caspase-1– and ASC-deficient mice infected with Mycobacterium tuberculosis. At the same time, it has been shown that caspase-8 can cleave pro–IL-1b next to caspase-1 (24, 25). Biologically, IL-1β is a key cytokine involved in many chronic inflammatory diseases—for example, rheumatoid arthritis, systemic juvenile idiopathic arthritis, and familial Mediterranean fever (26). Because of the clinical relevance of chronically elevated IL-1β as a master cytokine promoting inflammation and subsequent tissue destruction, different pharmacological IL-1β inhibitors have been introduced into clinical therapy for rheumatoid arthritis and other chronic inflammatory diseases (26). However, with respect to the induction of adaptive T cell immunity, IL-1β has been demonstrated to synergize with IL-2 to induce tumor-specific cytotoxic CD8+ T cells and to inhibit Tregs (27, 28). Furthermore, release of IL-1β has been implicated in playing a critical role for the priming of CD8+ T cell–mediated antitumor immunity by DC (29). In view of the paucity of information concerning the immunostimulatory activity of ECP and the well-documented efficacy of ECP for the treatment of cutaneous T cell lymphomas for >25 y, we have systematically analyzed the modulation of cytokine production capacity by ECP. Our results indicate that ECP markedly promotes IL-1β production in an ECP-dependent manner. Owing to the key role of IL-1β in bridging innate and adaptive immunity, our findings provide new insight into the immunostimulatory capacity of ECP. The in vitro studies of human blood samples were approved by the ethics study board of the University Hospital Giessen (File No. 05/00), and the animal experiments were approved by the animal ethics review board of the Regierungspräsidium Giessen (File No. A43/2009). The analysis of samples from patients undergoing clinical ECP treatment was approved by the ethics board of the University Hospital Giessen (File No. 136/10). Compounds were as follows: 8-MOP (stock solution 0.002%), prepared by the pharmacy of the University Hospital Giessen and Marburg; LPS from Escherichia coli 026:B6 (Sigma-Aldrich, Munich, Germany); R848 (InvivoGen, Toulouse, France); caspase-1,4 inhibitor z-YVAD-FMK (R&D Systems, Wiesbaden, Germany); ATP (InvivoGen); nigericin (Invitrogen, Darmstadt, Germany); apyrase grade III (Sigma-Aldrich). Stock solutions were diluted on the day of the experiment with RPMI 1640 medium (PAA Laboratories, Cölbe, Germany). Human PBMC were isolated from buffy coats of healthy blood donors by Ficoll-Paque (Amersham Bioscience, Uppsala, Sweden) density gradient centrifugation. CD14+ monocytes were purified (>95%) using CD14 immunomagnetic microbeads (Miltenyi Biotec, Bergisch-Gladbach, Germany), and 1 × 106 cells per milliliter were cultured in six-well flat-bottom plates, in 3 ml culture medium, comprising RPMI 1640 (PAA Laboratories), nonessential amino acids (Sigma-Aldrich), sodium pyruvate (Life Technologies, Darmstadt, Germany), penicillin–streptomycin (PAA Laboratories), HEPES (Invitrogen), and 10% heat-inactivated FCS (PAA Laboratories, Linz, Austria). Bone marrow–derived DC were generated as described with minor modifications (30). Briefly, murine BM cells from C57BL/6NCrl (Charles River, Cologne, Germany) and caspase-1 knockout (KO) mice (Dr. Bernhard Brüne, Frankfurt, Germany) were cultured for 6 d in RPMI 1640 (PAA Laboratories) with 10% heat-inactivated FCS (PAA Laboratories), nonessential amino acids (Sigma-Aldrich), sodium pyruvate (Life Technologies), penicillin–streptomycin (PAA Laboratories), HEPES, (Invitrogen), 1000 U/ml murine GM-CSF, and 1000 U/ml murine IL-4 (PeproTech, Hamburg, Germany). After 3 d, 75% of the supernatant was replaced with fresh cytokine-containing medium. On day 6, ≥50% of the nonadherent cells expressed CD11c. After incubation with 8-MOP (1 h at 37°C), cell suspensions in 96-well flat-bottom wells (Greiner, Frickenhausen, Germany) were UVA irradiated with a Biolink BLX-365 device equipped with UVA tubes (Vilber Lourmat, Eberhardzell, Germany). Controlled UVA dose (joules per square centimeter) irradiation was selected, and the emitted UVA dose per square centimeter was controlled independently with a calibrated UVA dosimeter, RM-21 (UV Gröbel, Ettlingen, Germany). Negative controls included samples without 8-MOP as well as non-UVA controls. The non-UVA controls were also placed into the irradiator but not irradiated. After UVA irradiation, samples were cultured at 37°C in a humidified air chamber at 5% CO2. LPS, ATP, nigericin, apyrase, and z-YVAD-FMK were used at the following concentrations unless otherwise indicated: 250 pg/ml, 5 mM, 10 μM, 10 U/ml, and 20 μM, respectively. LPS priming was performed for 2 h (human cells) or 4 h (murine cells), and cytokine expression was analyzed after overnight incubation (12–16 h) following UVA irradiation. In the absence of LPS priming, nigericin or ATP was added after overnight incubation (12–16 h) after UVA irradiation, and IL-1β was quantitated 1 h after nigericin/ATP activation. Proteins were precipitated from cell culture supernatants by adding an equal volume of methanol and 0.25 volume of chloroform, vortexed, and centrifuged at 13.000 × g for 5 min. The aqueous phase was discarded, and 500 μl methanol was added to the interphase. This mixture was centrifuged at 13.000 × g for 5 min, and the protein pellet was dried at 55°C, resuspended in Laemmli buffer, and boiled at 95°C for 5 min. Samples were separated by Bis-Tris-Gel (10%) and further transferred to a 0,2-μM nitrocellulose membrane (31). As indicated, blots were incubated with mouse mAb to anti–murine caspase-1 p20 (Casper-1; Adipogen International, San Diego, CA), mouse monoclonal anti–human caspase-1 p20 (Bally-1, Adipogen International), goat polyclonal anti–murine IL-1β (R&D Systems, Minneapolis, MN) or goat polyclonal anti–human IL-1 β/IL-1F2 (R&D Systems, Minneapolis, MN). Secondary Abs were goat anti–mouse IgG-HRP (sc-2005; Santa Cruz Biotechnology, Santa Cruz, CA) and donkey anti–goat IgG-HRP (sc-2020; Santa Cruz Biotechnology). β-Actin expression was detected by anti-human/mouse β-actin HRP (sc-47778; Santa Cruz Biotechnology). In the end membranes were developed using ECL Western Blotting Substrate (Pierce/Thermo Scientific, Pittsburgh, PA). Flow cytometry analyses were performed on a FACSCanto II cytometer equipped with FACSDiva software (Becton Dickinson, San Jose, CA). mAbs were from BioLegend (Fell, Germany), unless otherwise indicated. Cell samples were incubated for 30 min at 4°C in PBS pH 7.2 (PAA Laboratories), 2 mM EDTA (Sigma-Aldrich), and 2% BSA (Serva, Heidelberg,Germany), with mAbs for CD4+ (CD3+CD4+) and CD8+ T cells (CD3+CD8+), NK cells (CD16+, CD56+), B cells (CD19+), and monocytes (CD14+). Blood DC subsets were identified according to consensus markers for myeloid DC1 (CD1c+), myeloid DC2 (CD141+), and plasmacytoid DC (CD303+; Miltenyi Biotec) in combination with CD14 and CD19 staining to exclude contaminating monocytes and B cells (32, 33). Activation of CD14+ cells was analyzed after surface staining with HLA-DR (clone L243; BD Pharmingen, Heidelberg, Germany), CD40 (clone 5C3; BD Pharmingen), CD80 (clone L307.4; BD Pharmingen), and CD86 (clone 2331 Fun-1; BD Pharmingen). Nonspecific Fc receptor–mediated Ab binding was inhibited through preincubation with IgG (Gamunex; Talecris, Frankfurt, Germany) at a concentration of 0.15% for 15 min at 4°C. SYTOX dye was used according to the manufacturer’s instructions as a vital dye to exclude nonspecific staining of dead cells (BioLegend). Murine bone marrow–derived DC were characterized with anti-CD11c (clone N418), anti–I-A/I-E (MHC class II, clone M5/114.15.2), and anti-CD86 (clone GL-1) surface staining. Human- and murine-specific pro–IL-1β and mature IL-1β were quantitated with the following ELISA assays: human pro–IL-1β immunoassay (R&D Systems), human IL-1β ELISA, mouse proform IL-1β ELISA, and mouse IL-1β ELISA (all Ready-SET-Go! assays, eBioscience, Frankfurt am Main, Germany). Human IL-2, IL-5, IL-6, IL-10, IL-12p70, IFN-γ, and TNF-α were quantitated with ELISA sets from BD Biosciences Pharmingen. ECP of clinical patients was performed by the so-called “off-line” technique as described in detail in Ref. 34. Briefly, mononuclear leukapheresis was performed with a cell separator (MCS; Haemonetics, Munich, Germany). After collection of mononuclear leukocytes from two total patient blood volumes, the cell concentrate was transferred to a UV-permeable bag (XUV8501Q; Macopharma, Hamburg, Germany) and diluted with NaCl to obtain a hematocrit <2%. 8-MOP (final concentration 400 ng/ml) was added to the cell concentrate. After incubation for 15 min, the bag was placed into the UVA irradiation chamber BS05 (Gröbel). The irradiation time is dose controlled during each irradiation procedure with on-site UVA sensors and depends on the age of the UVA light bulbs. After UVA irradiation with 3 J/cm2, the irradiated cells were retransfused into the patient. The procedure was quality controlled by measuring inhibition of anti-CD3 (1 μg/ml; HIT3a, BioLegend), and anti-CD28 (1 μg/ml; 28.2; BD Pharmingen) induced T cell proliferation as described (35). ECP-induced inhibition of T cell proliferation was consistently in the range of >95%, in comparison with non-ECP controls. Clinical samples were taken from the leukapheresate before and after UVA irradiation (1 ml) and from patients’ peripheral blood (0.2 ml; 1:5 diluted in culture medium) before and 30 min after completion of ECP. The samples were stimulated in 24-well plates with 0.1 μg/ml LPS for 24 h. Culture medium consisted of RPMI 1640 (PAA Laboratories), nonessential amino acids (Sigma-Aldrich), sodium pyruvate (Life Technologies), penicillin–streptomycin (PAA Laboratories), HEPES (Invitrogen), and 10% heat-inactivated FCS (PAA Laboratories, Linz, Austria). The significance of differences between groups was analyzed by one-way ANOVA and the Tukey posttest for multiple comparisons or two-tailed t test, if indicated. A p value < 0.05 was considered significant. Statistical analyses were performed with Prism 5.02 software (Graphpad software). To analyze the modulation of cytokine production by ECP, human PBMC were exposed to different amounts of UVA light and 8-MOP and subsequently stimulated with CD3/CD28 mAbs to activate T lymphocytes or LPS/R848 to broadly activate TLR4- and TLR7- expressing leukocytes. Unexpectedly, we found a striking induction of IL-1β release (∼10-fold) in TLR4/7-stimulated PBMC exposed to 2 J/cm2 UVA and 8-MOP (Fig. 1A). In contrast, all other cytokines were suppressed, except for TNF-α, which exhibited a moderate elevation (Fig. 1B–I). IL-1β induction was ECP dependent and occurred at a UVA/MOP dose combination commonly used in clinical ECP (35). IL-1β release was pronounced in purified CD14+ cells, indicating that human monocytes represented a primary source of ECP-triggered IL-1β (Fig. 2A–C). Because ECP promotes apoptosis of leukocytes, we questioned whether IL-1β induction was simply related to passive release of dead cells. However, exposure of cells to higher UVA doses (e.g., 4 J/cm2 UVA; Figs. 1A, 2A) was unable to trigger IL-1β release, indicating that viable cells are required for this phenomenon by ECP. UVA- and ECP-dependent IL-1β priming. Human PBMC were exposed to indicated dosages of 8-MOP (ng/ml) and UVA light (J/cm2) and stimulated after 24 h via TLR4/7 with LPS/R848 [1 μg/ml; (A–F)] or TCR with anti-CD3, CD28 mAbs [1 μg/ml; (G–I)]. Cytokine analysis by ELISA was performed 24 h after TLR/TCR stimulation. Mean ± SEM; n ≥ 4; *p < 0.05, **p < 0.01, ***p < 0.001. 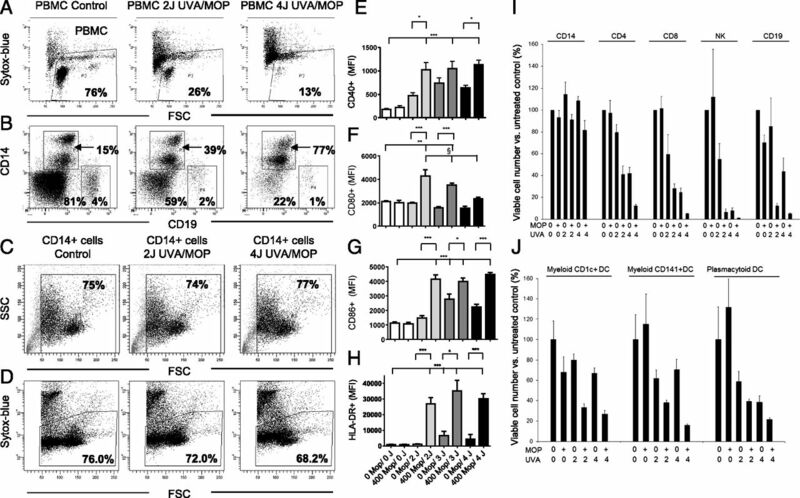 (A–C) UVA- and ECP-dependent priming of IL-1β in purified human monocytes. Purified CD14+ human monocytes were exposed to indicated dosages of 8-MOP (ng/ml) and UVA light (J/cm2) and stimulated after 24 h via TLR4/7 with LPS/R848 (1 μg/ml). Cytokine analysis by ELISA was performed 24 h after TLR stimulation. Mean ± SEM; n ≥ 4; *p < 0.05, ***p < 0.001. Release of IL-1β in buffy coat preparations of human blood donors by ECP raised the question of which cell types survived UVA and psoralen exposition. Accordingly, we analyzed by multiparameter flow cytometry the viability of various peripheral blood leukocyte subsets, including both CD1c+ and CD141+ myeloid DCs, and CD303+ plasmacytoid DCs. These experiments revealed selective survival of CD14high and CD14low cells in comparison with all other tested subsets (Fig. 3). In contrast, the death of T cells, NK cells, B cells, and DC subpopulations was efficiently mediated by UVA/MOP exposure (Fig. 3I, 3J). Selective survival of CD14+ cells by ECP was confirmed by additional ECP experiments with purified CD14+ monocytes (Fig. 3C, 3D). Surviving CD14+ cells represented professional APCs, as indicated by high T cell costimulatory molecule CD40, CD80, CD86, and high MHC class II expression (Fig. 3E–H). It should be noted that CD40, CD86, and MHC class II upregulation was most pronounced on ECP-treated cells and only moderately elevated on UVA-only exposed cells (Fig. 3E–H). Of interest, CD80 expression, in contrast to other costimulatory molecules, decreased with increasing UVA irradiation (Fig. 3F). Because LPS represents a potent inflammatory stimulus, promoting both priming and activation of the inflammasome, we questioned whether ECP can also induce IL-1β release in the absence of LPS. To this end, we extended our experiments to murine bone marrow–derived DC to be able to include gene-deficient mouse models. Murine DC were subjected to ECP, and inflammasome activation was triggered with ATP and nigericin. Both ATP and nigericin resulted in significant IL-1β release in ECP-primed DC, with a maximum after UVA irradiation in the presence of 8-MOP, indicating that ECP can prime IL-1β in the absence of LPS (Fig. 4). In contrast, in the absence or after incomplete ECP (UVA or 8-MOP only), IL-1β release was close to or below the detection limit (≤7.8 pg/ml; Fig. 4). LPS-independent IL-1β priming by ECP. Murine bone marrow–derived DC were primed with 8-MOP (800 ng/ml) and UVA light (J/cm2) and activated with ATP or nigericin. IL-1β expression was quantitated by ELISA. Mean ± SEM; pooled data from n = 3 separate experiments; ***p < 0.001. In addition to priming for IL-1β, ECP itself also induced the release of mature IL-1β in LPS-primed murine DC and human PBMC in a psoralen dose–dependent fashion (Fig. 5A, 5B). We used different MOP concentrations to demonstrate that there is some extent of psoralen dose dependency and to show that IL-1β induction can be observed at MOP concentrations <400 ng/ml in human cells (Fig. 5B). Of note, variability was considerable with regard to the absolute amounts of IL-1β produced between different experiments, reflecting biological variability of different batches of in vitro–generated murine DC. We analyzed the possibility that the detected human or murine IL-1β represented pro–IL-1β instead of mature IL-1β by controlling the specificity and cross-reactivity of the ELISA systems with recombinant pro–IL-1β and by quantitating both pro– and mature IL-1β with specific ELISAs. The cross-reactivity of the ELISA assays for murine and human pro–IL-1β was <2% and <8%, respectively (Fig. 5C, 5D), indicating that ECP-triggered IL-1β represented primarily mature IL-1β. In addition, parallel quantification of both pro– and mature IL-1β by ELISA indicated that ECP primarily induced the release of mature IL-1β (Fig. 5E). ECP activated significant IL-1β release in murine bone marrow–derived DC and human PBMC and cleaved IL-1β concomitant with active caspase-1 detection by Western blot, consistent with inflammasome activation (Fig. 5F, 5G). 8-MOP, UVA light, or combinations thereof added to unprimed cells did not release cleaved IL-1β in the supernatant, indicating the absence of contaminants being sufficient to prime the cells (Fig. 5A, 5B, 5F, 5G). ECP activates caspase-1 and the release of cleaved IL-1β in human and murine cells. Murine bone marrow–derived DC (A and F) and human PBMC (B, E, and G) were primed with LPS and exposed to indicated dosages of 8-MOP (ng/ml) and UVA light (J/cm2). IL-1β expression was quantitated by ELISA (A and B). ELISA specificity for mature IL-β was quantitated by titration of murine (C) and human (D) recombinant pro–IL-β as well as by direct quantification of pro–IL-β and mature IL-β after ECP (E). 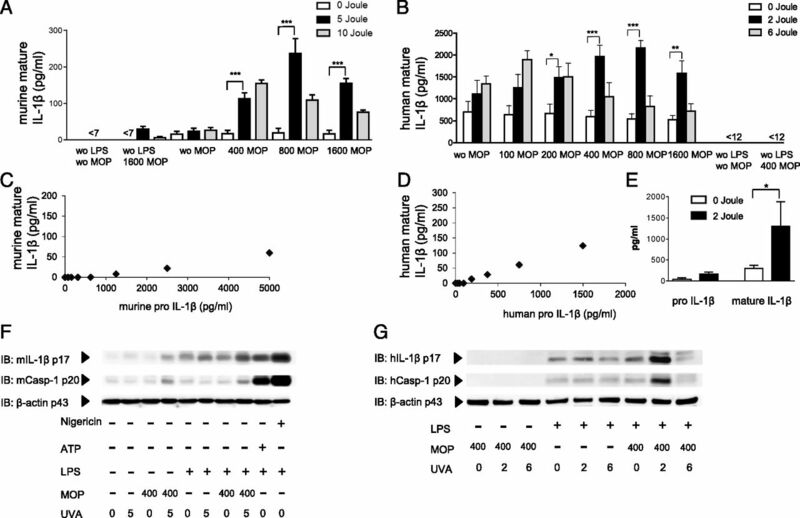 Cleavage of murine (F) and human (G) caspase-1 and IL-1β was analyzed by Western blot. Mean ± SEM (A and B); pooled data from n ≥ 3 separate experiments (A, B, and E–G); *p < 0.05, **p < 0.01, ***p < 0.001. To assess the possibility that release of ATP of dying cells was responsible for IL-1β activation after ECP, we performed experiments with apyrase, which inactivates ATP through hydrolysis. ECP-mediated IL-1β activation was not suppressed but rather increased in the presence of apyrase, indicating that extracellular ATP was not responsible for IL-1β activation after ECP (Fig. 6A). Of note, apyrase added to controls activated with exogenous ATP blocked IL-1β release, indicating the presence of biologically active apyrase and efficient ATP hydrolysis (Fig. 6B). Modulation of IL-1β production by ATP hydrolysis. (A) Murine bone marrow–derived DC were primed with LPS (250 pg/ml) and activated by ECP in the presence of the ATP-hydrolyzing enzyme apyrase (10 U/ml). (B) Apyrase-positive controls included LPS-primed samples that were activated by ATP in the presence of apyrase. IL-1β expression was quantitated by ELISA. Mean ± SEM; pooled data from n = 5 separate experiments; *p < 0.05, **p < 0.01, ***p < 0.001 versus 0 Joule (A) versus apyrase (B). Caspase-1 activation and release of cleaved IL-1β suggested inflammasome activation by ECP. To determine caspase-1 dependency, we analyzed IL-1β release in the presence of the caspase-1 inhibitor zYVAD-fmk in human PBMC. We found that zYVAD-fmk partially inhibited IL-1β release in all treatment groups (Fig. 7A). However, zYVAD-fmk did not prevent ECP-induced IL-β release when compared with unexposed controls (0 Joule UVA). Indeed, in the context of caspase-1 inhibition, a far more pronounced difference was observed between ECP treatment and the control condition. These results alluded to the possibility that ECP may activate IL-1β via caspase-1–dependent and –independent mechanisms. Caspase-1–independent IL-1β induction by ECP. Human PBMC and murine bone marrow–derived DC were primed with LPS and exposed to 8-MOP and UVA light (J/cm2). (A) Human PBMC were ECP treated in the presence of the caspase-1 inhibitor zYVAD-FMK (20 μM). (B) Murine bone marrow–derived DC were expanded from wild-type and caspase-1 KO animals. Quantification of pro–IL-1β (C) and mature IL-1β (D) of LPS-primed (5 ng/ml) control DCs from caspase-1 KO and wild-type C57/BL6 animals exposed to nigericin (C and D). Quantification of IL-1β by ELISA (E and F) and Western blot (G) of ECP-treated DC from caspase-1 KO (E and G) and wild-type (F) animals. Mean ± SEM; pooled data from n ≥ 3 experiments; *p < 0.05, **p < 0.01, ***p < 0.001. To further elucidate inflammasome and caspase-1 dependency in ECP-mediated IL-1β release, we analyzed LPS-primed bone marrow–derived DC from caspase-1 KO mice (Fig. 7B–G). Caspase-1 gene deficiency did not interfere with bone marrow–derived DC differentiation, as indicated by comparable CD11c, CD86, and MHC class II expression (Fig. 7B). At the same time, caspase-1–deficient cells failed to release mature IL-1β in response to the canonical NLRP3 stimulus LPS/nigericin, whereas wild-type cells secreted mature IL-1β, as expected (Fig. 7C, 7D). Surprisingly, ECP treatment still induced comparable amounts of IL-1β release in both wild-type caspase-1–deficient cells, as assessed by ELISA (Fig. 7E–F). Western blot analyses of caspase-1 KO DC confirmed marked release of cleaved IL-1β in the absence of the active caspase p10 subunit, indicating caspase-1–independent IL-1β release by ECP (Fig. 7G). Having established that ECP promotes IL-1β induction and maturation in human and murine cells, we tested whether ECP promoted IL-1β induction in clinical patients. Apheresate concentrate samples from patients were stimulated with LPS before and after ECP. IL-1β was quantitated by pro–IL-1β– and mature IL-1β–specific ELISA. ECP treatment resulted in a significant increase of mature IL-1β (p < 0.01, n = 10; Fig. 8A) but no significant elevation of pro–IL-1β (Fig. 8B). Because the apheresis concentrate is returned to the patient after completion of ECP, we also tested the peripheral blood capacity of patients before and after ECP to produce bioactive IL-1β. Peripheral blood samples of patients were taken before ECP and 30 min after completion of ECP. Results of LPS-stimulated peripheral blood samples showed significantly elevated bioactive IL-1β after ECP in comparison with pre-ECP samples from the same patient, indicating increased systemic IL-1β production capacity (p < 0.05, n = 8; Fig. 8C). Pro–IL-1β was below the detection limit in the peripheral blood of patients. IL-1β induction in patients by ECP. Clinical samples were taken from leukapheresate concentrate before and after ECP (A and B) or from patients’ peripheral blood before and 30 min after completion of ECP (C) and were LPS stimulated. IL-1β and pro–IL-1β were quantitated by ELISA. Pro–IL-1β in peripheral blood samples was below the detection limit (12 pg/ml). Mean ± SEM; n = 10 (A and B), n = 8 (C); *p < 0.05. In this article, we report the novel finding that ECP promotes release of mature IL-1β. IL-1β is a key immunostimulatory molecule belonging, along with IL-1α, IL-18, IL-36, and IL-37, to the IL-1 family (36). IL-1β is primarily produced by myeloid cells and represents a central mediator of antimicrobial resistance, inflammation, and Th 17 differentiation (36). Several reports have revealed the immunoregulatory capacity of ECP via Treg induction, but little is known regarding the induction of immunostimulatory mediators by ECP (10–12). Different groups have reported that ECP promoted the differentiation and partial maturation of DC based on surface costimulatory molecule expression, migratory activity, and Ag presentation assays (13, 37, 38). Of interest, Holtick et al. (37) reported an increased immunostimulatory and migratory capacity of ECP-treated monocyte-derived DC. Furthermore, with respect to survival and apoptosis, our results indicated selective survival of CD14+ monocytes after ECP, in contrast to massive lymphocyte apoptosis. However, preferential survival of CD14+ cells 48 h after ECP does not guarantee that these cells survive indefinitely. Interestingly, Spisek et al. (39) also reported massive lymphocyte apoptosis after ECP, whereas apoptosis of DC and monocytes did not differ between ECP-treated and untreated controls. Moreover, after a 7-d culture of purified ECP-treated myeloid DC, 45% of cells were still viable, indicating robust viability of professional APC after ECP (39). However, key factors for the functional modulation of professional APC are soluble cytokines (so-called signal 3) that shape the immune response and are indispensable for induction of either effector T cells or Tregs (40, 41). As a consequence, IL-1β and other immunostimulatory cytokines have been introduced into improved DC-based cancer vaccines to promote fully mature DC with maximal immunogenicity (42, 43). Our experiments have revealed that ECP promoted IL-1β induction in myeloid cell types of human and mouse origin under different experimental conditions. Moreover, clinical samples from patients receiving ECP confirmed IL-1β triggering by ECP. Furthermore, ECP primed PBMC and DC for IL-1β production as well as IL-1β maturation and release in LPS-primed samples. By dissecting the different elements of ECP, we found that IL-1β induction is strictly ECP dependent. Our immunoblot analyses indicated that ECP activated cleavage of caspase-1, suggesting inflammasome activation as a possible mechanism of ECP-induced bioactive IL-1β. However, additional analyses with caspase-1 KO animals demonstrated that ECP can trigger comparable amounts of cleaved IL-1β in the absence of caspase-1. Caspase-8 may represent a candidate for caspase-1–independent IL-1β induction; further studies are clearly required to address the important question of caspase-1–independent IL-1β induction by ECP (24, 25, 44, 45). Unexpectedly, after using the ATP-hydrolyzing enzyme apyrase, we have detected even greater IL-1β production after ECP. Because ATP does not act exclusively on the inflammasome but additionally has been reported to promote cellular damage via other pathways, one possible explanation could be that ATP removal via apyrase suppressed inhibitory or toxic by-products created by ECP (46).This activity may have improved cellular viability or the capacity to produce mature IL-1β. Our study raises the question of whether psoralen is required or possibly counterproductive for the immunoregulatory activity of ECP because ECP-triggered IL-1β and upregulation are ECP dependent. Several studies reported that IL-1β is a major factor inhibiting Tregs (28, 47, 48). Moreover, in our study, IL-10 production in ECP-treated PBMC that were stimulated via TLR4/7 was completely abrogated in the presence of psoralen. In contrast to direct IL-10 inhibition in ECP-treated PBMC, many studies have demonstrated elevated IL-10 either in ECP-untreated DC/monocytes being cocultured with ECP-exposed cells (12, 49, 50) or in ECP Tregs, and the requirement for IL-10 was demonstrated in IL-10–deficient mice (10). Furthermore, additional data have suggested that ECP promoted Treg expansion in recipients (51, 52). In our view, these results support the hypothesis that ECP may have dual immunomodulatory activity: immunoregulatory activity of ECP-treated apoptotic lymphocytes interacting with ECP-unexposed host cells and possible immunostimulatory activity of directly ECP-exposed monocytes. In accordance with this hypothesis, we have demonstrated selective survival of ECP-exposed CD14+ monocytes together with significant upregulation of costimulatory and MHC class II molecules. Future animal studies dissecting the immunomodulatory capacity of ECP-exposed and -unexposed APC are necessary to address this issue. In summary, using different in vitro models and analyzing ex vivo clinical samples, we have provided evidence that ECP markedly promotes bioactive IL-1β production. These findings provide new insight into the immunostimulatory activity of ECP and the clinical effectiveness of photopheresis in cancer immunotherapy. The identification of psoralen as a key factor promoting IL-1β production may help in the design of novel ECP-based techniques with improved immunoregulatory capacity in the future. We thank the medical staff at the Institute of Clinical Immunology and Transfusion Medicine, University Hospital of Giessen and Marburg, who cared for patients and their families. This work was supported by a grant from the University Hospital Giessen and Marburg, Rhön Hospital Group for Clinical Science, and by the Excellence Cluster Cardio-Pulmonary System, German Science Foundation (to H.H.).
. 2000. Extracorporeal photochemotherapy in the treatment of severe steroid-refractory acute graft-versus-host disease: a pilot study. Blood 96: 2426–2431.
. 2008. A multicenter prospective phase 2 randomized study of extracorporeal photopheresis for treatment of chronic graft-versus-host disease. Blood 112: 2667–2674.
. 2009. Mini buffy coat photopheresis for children and critically ill patients with extracorporeal photopheresis contraindications. Transfusion 49: 2366–2373.
. 2011. Update on extracorporeal photopheresis in heart and lung transplantation. J. Clin. Apher. 26: 146–151.
. 1987. Treatment of cutaneous T-cell lymphoma by extracorporeal photochemotherapy. Preliminary results. N. Engl. J. Med. 316: 297–303.
. 2012. Long-term follow-up and survival of cutaneous T-cell lymphoma patients treated with extracorporeal photopheresis. Photodermatol. Photoimmunol. Photomed. 28: 250–257.
. 2013. Extracorporeal photopheresis for the treatment of erythrodermic cutaneous T-cell lymphoma: a single center clinical experience with long-term follow-up data and a brief overview of the literature. Int. J. Dermatol. 52: 1308–1318.
. 2012. Extracorporeal photopheresis as a curative treatment strategy in non epidermotropic T-cell lymphoma and large granular lymphocyte leukemia. Ann. Oncol. 23: 2386–2390.
. 2013. Photopheresis (extracorporeal photochemotherapy). Photochem. Photobiol. Sci. 12: 22–28.
. 2008. Experimental extracorporeal photopheresis inhibits the sensitization and effector phases of contact hypersensitivity via two mechanisms: generation of IL-10 and induction of regulatory T cells. J. Immunol. 181: 5956–5962.
. 2008. Extracorporeal photopheresis reverses experimental graft-versus-host disease through regulatory T cells. Blood 112: 1515–1521.
. 2011. Extracorporeal photopheresis attenuates murine graft-versus-host disease via bone marrow-derived interleukin-10 and preserves responses to dendritic cell vaccination. Biol. Blood Marrow Transplant. 17: 790–799.
. 2010. Rapid generation of maturationally synchronized human dendritic cells: contribution to the clinical efficacy of extracorporeal photochemotherapy. Blood 116: 4838–4847.
. 2013. Augmentation of blood dendritic cells by extracorporeal photopheresis in patients with leukemic cutaneous T-cell lymphoma and graft-versus-host disease. J. Invest. Dermatol. 133: 2098–2100.
. 1992. Extracorporeal photochemotherapy induces the production of tumor necrosis factor-alpha by monocytes: implications for the treatment of cutaneous T-cell lymphoma and systemic sclerosis. J. Invest. Dermatol. 98: 686–692. 2011. A clinical perspective of IL-1β as the gatekeeper of inflammation. Eur. J. Immunol. 41: 1203–1217.
. 2010. NLRP3 inflammasomes are required for atherogenesis and activated by cholesterol crystals. Nature 464: 1357–1361.
. 2013. Of inflammasomes and pathogens—sensing of microbes by the inflammasome. EMBO Mol. Med. 5: 814–826.
. 2009. Caspase 1-independent activation of interleukin-1beta in neutrophil-predominant inflammation. Arthritis Rheum. 60: 3642–3650. 2009. Multiple interleukin-1beta-converting enzymes contribute to inflammatory arthritis. Arthritis Rheum. 60: 3524–3530.
. 2009. Inflammatory arthritis in caspase 1 gene-deficient mice: contribution of proteinase 3 to caspase 1-independent production of bioactive interleukin-1beta. Arthritis Rheum. 60: 3651–3662.
. 2010. Caspase-1 independent IL-1beta production is critical for host resistance to Mycobacterium tuberculosis and does not require TLR signaling in vivo. J. Immunol. 184: 3326–3330.
. 2014. Cutting edge: endoplasmic reticulum stress licenses macrophages to produce mature IL-1β in response to TLR4 stimulation through a caspase-8- and TRIF-dependent pathway. J. Immunol. 192: 2029–2033.
. 2014. FADD and caspase-8 mediate priming and activation of the canonical and noncanonical Nlrp3 inflammasomes. J. Immunol. 192: 1835–1846.
. 1994. Interleukin 1 beta synergises with interleukin 2 in the outgrowth of autologous tumour-reactive CD8+ effectors. Br. J. Cancer 70: 625–630.
. 2009. Activation of the NLRP3 inflammasome in dendritic cells induces IL-1beta-dependent adaptive immunity against tumors. Nat. Med. 15: 1170–1178.
. 2003. Rapamycin inhibits IL-4–induced dendritic cell maturation in vitro and dendritic cell mobilization and function in vivo. Blood 101: 4457–4463.
. 2013. Immunoblotting for active caspase-1. Methods Mol. Biol. 1040: 103–115.
. 2000. BDCA-2, BDCA-3, and BDCA-4: three markers for distinct subsets of dendritic cells in human peripheral blood. J. Immunol. 165: 6037–6046.
. 2014. Identification of novel dendritic cell subset markers in human blood. Biochem. Biophys. Res. Commun. 443: 453–457. 2003. Extracorporeal photopheresis technical aspects. Transfus. Apheresis Sci. 28: 51–61.
. 2003. Quality control for the validation of extracorporeal photopheresis process using the Vilbert-Lourmat UV-A irradiation’s system. Transfus. Apheresis Sci. 28: 63–70.
. 2013. The interleukin-1 family: back to the future. Immunity 39: 1003–1018.
. 2008. Impact of psoralen/UVA-treatment on survival, activation, and immunostimulatory capacity of monocyte-derived dendritic cells. Transplantation 85: 757–766.
. 2007. Clinical-scale generation of strongly CD83-expressing dendritic cells using extracorporeal photopheresis. Photodermatol. Photoimmunol. Photomed. 23: 113–119.
. 2006. Maturation state of dendritic cells during the extracorporeal photopheresis and its relevance for the treatment of chronic graft-versus-host disease. Transfusion 46: 55–65.
. 2010. Polarized dendritic cells as cancer vaccines: directing effector-type T cells to tumors. Semin. Immunol. 22: 173–182.
. 2004. Dendritic cells: emerging pharmacological targets of immunosuppressive drugs. Nat. Rev. Immunol. 4: 24–34.
. 1997. Pro-inflammatory cytokines and prostaglandins induce maturation of potent immunostimulatory dendritic cells under fetal calf serum-free conditions. Eur. J. Immunol. 27: 3135–3142. 2009. Dendritic cells in immunotherapy of established cancer: Roles of signals 1, 2, 3 and 4. Curr. Opin. Investig. Drugs 10: 526–535.
. 2013. Proapoptotic chemotherapeutic drugs induce noncanonical processing and release of IL-1β via caspase-8 in dendritic cells. J. Immunol. 191: 4789–4803.
. 2014. Extracellular ATP drives systemic inflammation, tissue damage and mortality. Cell Death Dis. 5: e1102.
. 2012. 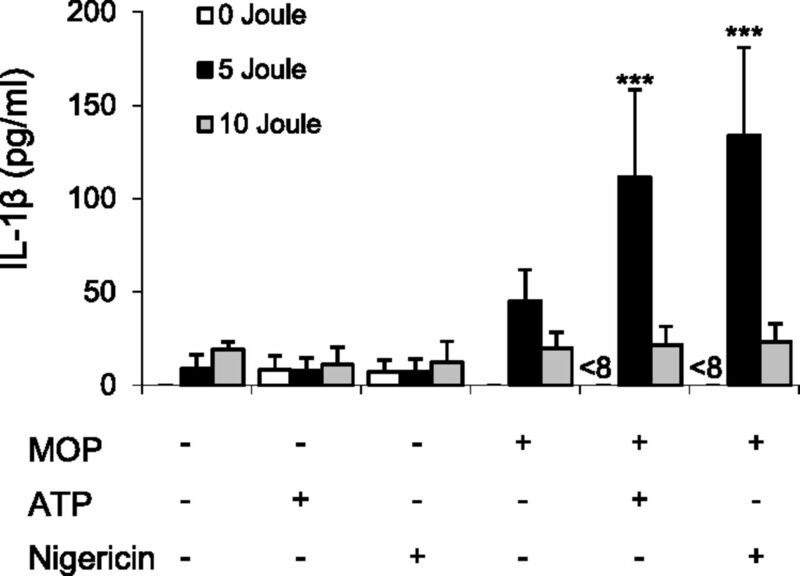 Helicobacter pylori induces in-vivo expansion of human regulatory T cells through stimulating interleukin-1β production by dendritic cells. Clin. Exp. Immunol. 170: 300–309.
. 2005. Extracorporeal photopheresis affects interleukin (IL)-10 and IL-12 production by monocytes in patients with chronic graft-versus-host disease. Br. J. Dermatol. 153: 59–65.
. 2008. Extracorporeal photopheresis affects co-stimulatory molecule expression and interleukin-10 production by dendritic cells in graft-versus-host disease patients. Clin. Exp. Immunol. 151: 407–413.
. 2014. Autologous apoptotic cells preceding transplantation enhance survival in lethal murine graft-versus-host models. Blood 124: 1832–1842.
. 2009. Extracorporeal photophoresis augments function of CD4+CD25+FoxP3+ regulatory T cells by triggering adenosine production. Transplantation 88: 411–416.